Two statewide southerners are seeing their fortunes move in opposite directions, while the weight of both a party label and a barrage of negative advertising look increasingly likely to sink one of the longest-serving members of the House. Here are this week’s Crystal Ball ratings changes in four gubernatorial, Senate and House contests. GEORGIA (GOVERNOR): Gov. Nathan Deal (R), who has dealt with numerous ethical questions over the years (not to mention orchestrating a horrible response to Atlanta’s 2014 ice storm), got another bad headline late last week: A jury found that the former director of the state ethics commission was forced out of office as retribution for investigating Deal’s 2010 gubernatorial campaign. The former director, Stacey Kalberman, will receive $700,000 as a result of the ruling. This story will likely linger: On Monday morning, Jim Galloway and other reporters at the Atlanta Journal-Constitution posted a piece headlined “Friday’s verdict just the beginning of trial trouble for Nathan Deal.” They note that other former ethics commission staffers have made similar claims as Kalberman, which could keep the controversy in the headlines for months. Meanwhile, state Sen. Jason Carter (D) is raising an impressive amount of money, and the grandson of the former president could pounce if Deal gets weaker. Hmmm — a statewide race in a Republican-leaning state where a strong Democratic challenger could pull off an upset if the Republican nominee is weak. What other race sounds like that? Oh yeah: It’s essentially the same scenario as Georgia’s other big statewide contest, the open-seat race to replace retiring Sen. Saxby Chambliss (R). Just like a poor Republican nominee could allow Michelle Nunn (D) to score an upset in the Senate race, so too could a damaged Deal open the door for Carter. In that regard, the races are similar. So we’re moving the Georgia gubernatorial race from Likely Republican to LEANS REPUBLICAN, to match our Leans Republican rating in the Senate race. We’re not yet willing to bet against the GOP holding the governorship and the Senate seat. It’s a GOP year, plus the Peach State isn’t at the tipping point to turning competitive purple. Thus, Republicans may well pull both chestnuts out of the fire. But our point is: They are playing with fire. PENNSYLVANIA (HOUSE, PA-6): A future Democratic House majority would almost assuredly involve Democrats cracking the Republicans’ Keystone State gerrymander, particularly in some Southeastern districts that lie in orbit of Philadelphia. The state’s Sixth, Seventh and Eighth congressional districts are all part of Greater Philadelphia, they all gave President Obama 53% of the vote in 2008 before all narrowly switching to Mitt Romney in 2012, and they are all represented by Republicans in the House. The retirement of one of these members, Rep. Jim Gerlach (R, PA-6), gave Democrats hopes that they could peel off one of these districts. However, candidate recruitment hasn’t gone the way they hoped: National Democrats were hoping that businessman Mike Parrish would be their candidate, but he dropped out last month, leaving physician Manan Trivedi as the likely nominee. Gerlach scored 57% of the vote against Trivedi in both 2010 and 2012, by far the two strongest of his six victories in this swingy seat, which was made more Republican in post-2010 redistricting. Moreover, Republicans feel good about their candidate, Chester County Commissioner Ryan Costello (R). This seat now LEANS REPUBLICAN. TENNESSEE (SENATE PRIMARY): The filing deadline in the Volunteer State has come and gone, and while Sen. Lamar Alexander (R) was hypothetically vulnerable to a conservative primary challenge, it doesn’t look like any of his eight primary opponents have what it takes to capitalize. The splintered field and lack of a top-tier challenger is especially helpful to Alexander; there’s no runoff in Tennessee, so Alexander doesn’t even need to get over 50% to win outright. 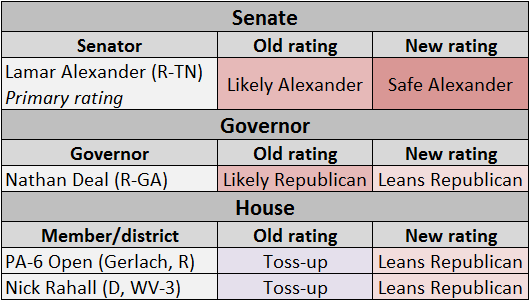 We’re changing our primary rating from Likely Alexander to SAFE ALEXANDER, and Alexander should also cruise in the general election in solidly Republican Tennessee. WEST VIRGINIA (HOUSE, WV-3): There are only three House Democrats who reside in districts where Mitt Romney performed at least 10 percentage points better than his national average (in other words, where Romney got 57% of the vote or more, 10 points higher than his national 47% performance). Two of those three Democrats are retiring: Reps. Jim Matheson (UT-4; 68% Romney) and Mike McIntyre (NC-7; 59% Romney). National Democrats are not seriously contesting these seats, and they should flip to Republicans in November. The third is Rep. Nick Rahall (WV-3, 65% Romney), who recently was rumored to be considering retirement but apparently decided against it. In this partisan age, Rahall is truly an outlier among House members running for reelection. Rahall’s district performed 18 points better for Romney than the Republican presidential nominee ran nationally in 2012. By comparison, the next most Republican seat a Democratic incumbent is defending is Rep. John Barrow’s GA-12, where Romney did eight points better than his national average. The most Democratic district that Republicans are defending is the open CA-31, which gave 57% of its votes to Obama, or six points more than the president’s national performance (51%). The Republican incumbent running in the district where Obama did the best is Rep. David Valadao (CA-21), where Obama ran four points better (55%) than he did nationally. In other words, Rahall could have the biggest drag from national forces of any House incumbent in either party in the country. Yes, Democrats still have a major party registration advantage in West Virginia, but how voters cast ballots matters a lot more than what they call themselves — or may have called themselves years ago when they first registered. These structural factors are not new, but what has changed our thinking on the race are some recent developments. Rahall joined the moderate-to-conservative Blue Dog Coalition in the House, after eschewing membership in previous cycles. He also argued that he voted with President George W. Bush more often than President Obama. (PolitiFact questioned his math.) And, as mentioned above, he reportedly recently considered retirement (he and his team vehemently deny this report). These are not moves made by a confident member. Additionally, the Republicans released an internal poll in March showing state Sen. Evan Jenkins (a Democrat-turned-Republican) up 14 points on Rahall. We doubt that Jenkins is even close to having that kind of lead at this point, but Democrats did not release an internal poll showing anything different. Conservatives have long smelled blood, and an avalanche of attack ads from Republican-oriented outside groups might have taken their toll. Democratic outside groups are now counterattacking. Democrats are betting that if they can hold this seat this cycle, conditions in West Virginia will improve when (they hope) Hillary Clinton is the Democratic presidential nominee. We’re skeptical: Over the last seven presidential elections, here is the Democratic presidential performance in West Virginia versus the nation as a whole: +6.6, +5.4, +2.3, -2.8, -5.1, -10.4 and -15.6. The state was trending Republican before Barack Obama came onto the scene. Democrats also argue that Rahall, first elected in 1976, is a known commodity in his district who can withstand an ad blitz, but how well-known can any member of the House actually be — and name identification does not necessarily equal continuing support. Longevity certainly didn’t help veteran House Democrats in many Red districts in 2010. The national environment probably won’t be as vicious for Democrats this year as it was four years ago, but it certainly could be in a district like WV-3, and Republicans are more committed to competing here than they were in 2010 or 2012. Whether he wins or loses this cycle, Rahall is probably going to be the last Democrat to occupy WV-3, as the Mountain State’s third House district appears likely to be eliminated after the 2020 census. West Virginia is growing at a much slower rate than other states. We understand why Democrats want to make a stand here: Rahall is a long-time incumbent and they need every seat they can get. He’s also only 64 despite his nearly four decades in the House; hypothetically, he could serve for much longer, although the state’s pending House contraction could ultimately end his career if he doesn’t lose this November. In a broader sense, a future Democratic House majority — which almost assuredly is not in the cards this cycle — is not built on seats like WV-3. In the here and now, we now see Rahall as a slight underdog in his reelection bid, and we’re moving the rating in his race to LEANS REPUBLICAN. Perhaps a Democratic counterattack will boost his numbers, but Rahall is uniquely positioned amongst Democratic House incumbents to be harmed by President Obama, and our new rating reflects that. Full ratings of all 2014 House, Senate and gubernatorial races, and our current projections for what changes we’ll see in November, are available at the Crystal Ball website.